Triangular in shape, with circular rooms in the three corner towers. This is not your average holiday home. The Landmark Trust took over management of the Gothic Temple in late 1960’s. The building was renovated between 1969 and 1970. The Landmark Trust preserves notable buildings of of distinction by renovating them and adding living space. Landmark Trust properties are rented out to visitors. The profits from the rentals fund further similar projects. The Gothic Temple sleeps four people with a high standard of comfort. The temple was built for Lord Cobham in 1741. Originally called the Temple of Liberty it had painted glass added in 1748. A domed ceiling was added in 1749. 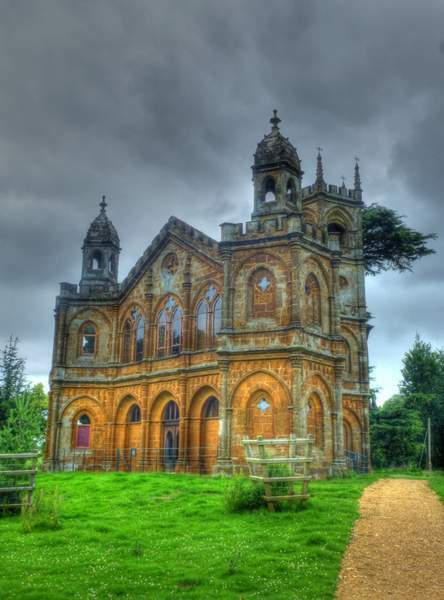 The Gothic Temple can only be visited by persons renting the property, although it is possible to see the building from the outside by visiting Stowe Gardens. The Gardens are managed by the National Trust while Stowe School still occupies Stowe Hall.